Kindness is a common sense between mankind and animals; it means the kindness is a sense and instinct in the essence of these creatures. Human beings promote kindness towards their fellowmen and also other creatures and animals also show kindness towards their conspecifics and even mankind. If mankind loves himself, will never commit rascalities and rouge actions and will never lose his human essence. Kindness is a peaceful sense which turns mankind away from revenge and aggressive actions. The aim of religions was to introduce the mankind into the basics of kindness and peace; however, during the last ten thousand years, the religious followers mixed these divine originated laws with violence and cruel rules. Nowadays, the kindness is minimized in the world. The kindness is affected by misunderstanding, suspicions, enmities and selfish behaviors even within the families, which is resulting in divorce. The children of such families, whose parents have divorced, are mostly unfamiliar with kindness and they often revolt against the social norms, so they are often vulnerable to addiction, crimes and prostitutions. We are living in a strange world, violence is promoting everywhere, and even in some countries the terrorist groups abuse the children for their satanic plots. Sometimes we see people showing kindness towards a dog, treat this animal as a member of their family, but at the same time they withhold such kindness from their fellowmen, neighbors, relatives and countrymen. Kindness brings about the best life for mankind. As an explorer of Monotheism excluding any borders, I recommend all human beings who are seeking peace and kindness to know and be sure that if we overcome such rascal actions and behaviors such as anger, hate, curse and rage, the kindness will grow up as beautiful flowers everywhere within our family as a small part of society, and across our city, country and the entire world. It is necessary to remind that if there was kindness, the poverty should never exist, so for example the European citizens could sympathize with the African people that what the hunger is! If there was kindness, then the countries with enormous oil and mineral resources would assist the poor countries. If the kindness was existing, the rulers should spend the national wealth for their citizens. If there is kindness, no one will afraid of religions, because the people are escaping from religion due to religious violence and misbehaviors and the cruelties committed with the fame of religious laws. Even some people are escaping from God, because some others oppress with the fame of the Lord and threaten the people. In brief, we have lack of kindness around the entire world. Do your best to promote the kindness everywhere! If there is kindness, the number of patients suffering from critical diseases such as cancer will be reduced, the hospitals and madhouses will become less busy, divorce and family separation will be disappeared, addiction will be demolished, fraud and robberies will be removed from human societies. All of such disasters are due to lack of kindness. 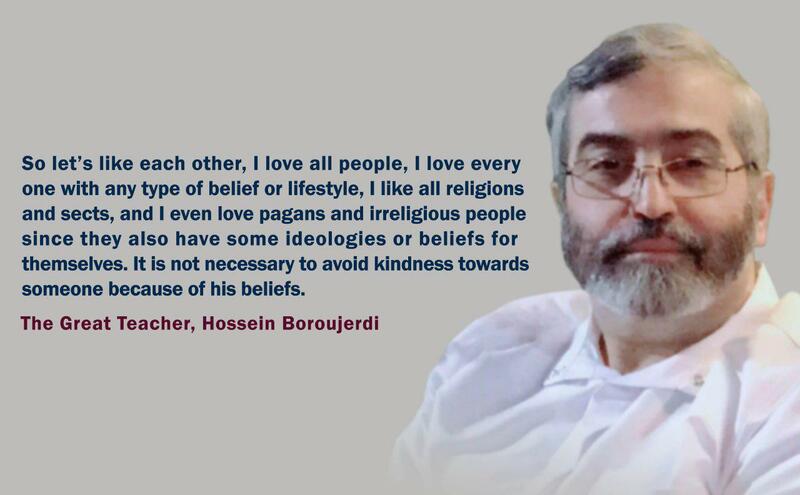 So let’s like each other, I love all people, I love everyone with any type of belief or lifestyle, I like all religions and sects, and I even love pagans and irreligious people since they also have some ideologies or beliefs for themselves. It is not necessary to avoid kindness towards someone because of his beliefs. If we stop showing kindness, then the enmity will be initiated which will result in battles and struggle, same as the critical situation dominating currently in some areas of the world. The first and second world war had happened in human history due to death of kindness. Now we are on the threshold of the third world war, again due to enmity between world powers and superpowers. However, the innocent people will be suffered from this huge catastrophe. Currently the risk of global devastation is threatening the seven billions world population. The Middle East is the center of this global war which definitely will result in demolishment of everything, because this are is the most important place where the enmity and malevolence is happening with the fame of religions. If the kindness will be existing, then we will have a world full of peace and joy instead of enmity and injustice.